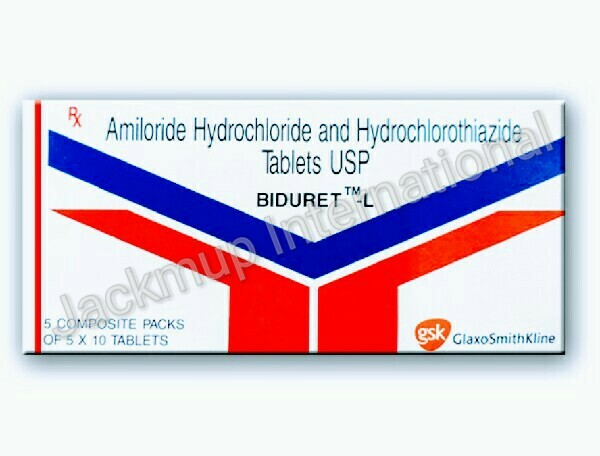 Description:- Amiloride is used in the treatment of increased blood pressure , heart failure, cirrhosis and low potassium. Amiloride lowers the swelling by removing the levels of excess water and electrolytes in the body. Amiloride does this without loss of potassium from the body. Inform your doctor if you are suffering from/have a history of difficulty in breathing, diabetes/heart/liver disease, abnormal levels of salts (electrolytes) in blood, increased blood urea levels, increased levels of acid in blood (acidosis). Do not take potassium supplements along with amiloride, it can cause severe hyperkalaemia. Amiloride may interfere with the results of glucose tolerance test. Talk to your doctor about instructions on use of this medicine before undergoing the test. Tell your doctor if you are or are planning to become pregnant or are breast-feeding. Do not use high salt diet while on amiloride treatment. Do not drive or operate machinery as amiloride can cause dizziness.